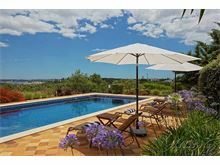 Casa Eira is an outstanding villa in a spectacular location and setting, perfect for exploring the delights of the western Algarve. 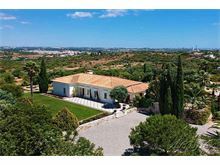 The vibrant and popular seaside resorts of Lagos and Alvor are a little more than 10 minutes drive away, yet Casa Eira enjoys an elevated position with far reaching views from its 13 acre plot close to the village of Mexilhoeira Grande. The village of Mexilhoeira Grande is approximately a 15 minute walk away and has a restaurant, shop and cafe and for those seeking something more Le Meridien Penina resort and its championship golf course and choice of restaurants is only 5 minutes away by car. 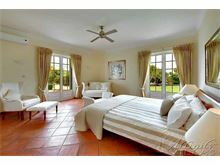 The villa is very spacious and beautifully furnished,surrounded by manicured lawns and terraces giving an almost colonial feel. 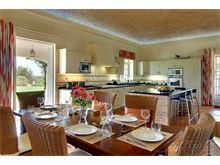 The fabulous kitchen would be the envy of any cook and with the dining area leading straight out to the covered terrace, via patio doors that slide back into the walls, is a perfect setting for creating those memorable holiday meals. The large pool is set to one side of the lawned area, flanked by trees and shrubs and taking full advantage of the far reaching views. 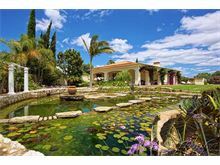 A herb garden and koi carp pond complete the tranquillity of the wonderful grounds. 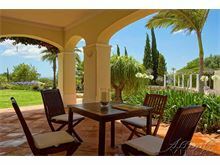 Casa Eira is a much loved and cherished home and it is very rare that such a property is available for holiday rental - it is certainly a place that is hard to leave after a memorable holiday. Approximately 3kms from the nearest shop & restaurant and 10kms from the beach. Gated driveway leading to parking and steps up to entrance porch. 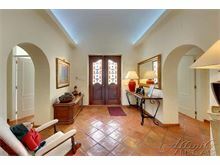 Into hallway with guest cloakroom and across to living area with TV, DVD, wood burning fire, stereo and patio doors to garden terrace. Living room leads to fully equipped kitchen dining area with TV and patio doors to the garden terrace and separate utility room with washing machine. Bedrooms are reached from corridor from hallway, master double with air conditioning (at extra charge) and patio doors to garden terrace, separate dressing area and en suite bathroom with picture patio window and separate walk in shower, second double bedroom with en suite shower room and third double bedroom with en suite shower room. 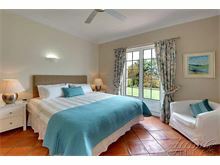 The owner has designed and constructed the villa to remain cool without the need for air conditioning however each bedroom is equipped with a ceiling fan and all windows have fly screens and sliding shutters. Maid service 2 times per week. 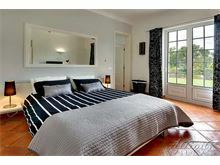 Air conditioning (master bedroom only) and WiFi are available at additional cost, if required. Beautiful villa. Perfectly attended to gardens and well designed pool area with amazing views. My wife and I were pretty much burnt out and needed a place to unwind, relax and see no one and that is exactly what we did. Wish we had two weeks instead of one. Always next year!! 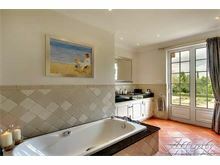 The most beautiful villa and superb garden we have stayed in to date. 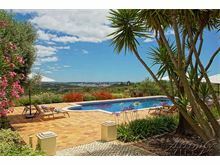 Really well located as Lagos, Alvor only 20mins drive. We will be booking again for next. 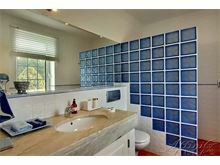 A beautiful luxurious villa with a magical garden set in a high location with wonderful views. Our children really enjoyed the swimming pool, and playing in the gardens. Feeding the fish each day in the pond and looking for frogs each night was also a big hit. Very peaceful location, and only a short drive from various attractions. Options for golf and tennis were also nearby. One week was not long enough. Looking forward to returning someday. It was very easy to relax and enjoy our holiday in this beautiful villa with its' stunning pool, wonderful gardens and far reaching views. This was our third stay at the villa, beautiful villa and a very comfortable stay. 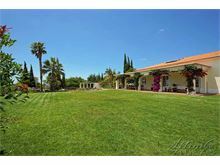 Truly exceptional Villa in quiet rural location 15 minutes from Lagos, providing exactly the relaxing holiday we were looking for. This villa is exceptional and very comfortable. The grounds are large with beautiful and well kept garden and planted areas. The pool is large and provides welcome relaxation and cooling down opportunities. The House Manager is caring and considerate ensuring you have the best holiday possible and nothing is too much trouble for her. 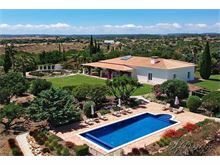 Location of the villa means a short drive to Alvor and Lagos where there are plenty of restaurants providing excellent choice and value for money. Accessibility also provides opportunities to travel to other places of interest - Silves and Carvoeiro for example. 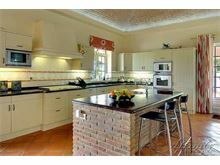 I cannot recommend this villa enough, it is beautiful, well maintained and a home from home! Outstanding holiday. 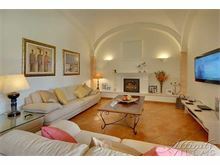 The villa is beautiful, well designed, well equipped and spacious. 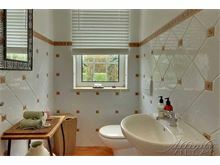 It is in a secluded location with wonderful views and has an immaculate garden with amazing pond. The pool is excellent. The pictures do not do it justice! We enjoyed a fantastic week at this true home from home villa. The house is beautiful, the views were amazing and the kitchen was fully stocked with everything you need to cook the beautiful produce growing in the garden! I would recommend this villa to everyone. 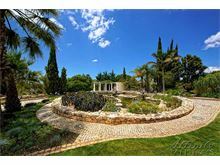 Excellent villa - beautiful gardens - simply brilliant! Casa Eira was immaculately maintained and the pictures do not do it justice. The gardener does an excellent job. A real home-from-home, we ate at the villa every evening and the kitchen had absolutely everything we needed (including space for two to work without bumping into each other!). It was a real advantage to have the villa opening onto lawn, rather than the pool, as it meant we could use that space well into the evening - in fact, up until it went dark and the frogs claimed it as their own! Highly recommended.